Looking for a new place to live? What about a four-bed flat with beasts? 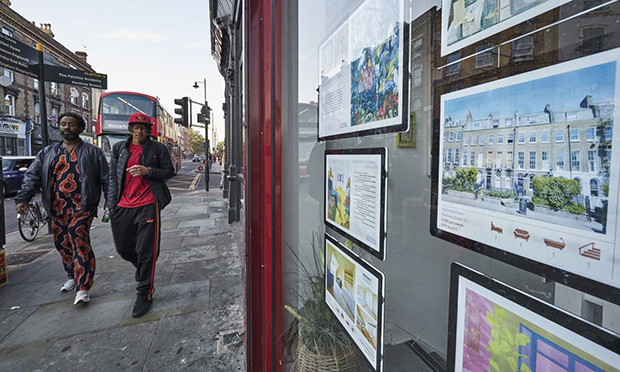 If you are passing Homefinders estate agency in Dalston, this is what you will see advertised in the window, together with paintings of psychedelic interiors and lines of verse promising “sea hags and selkies”. 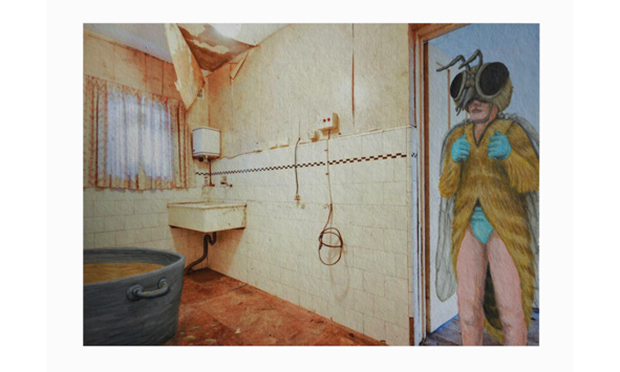 You may well do a double take; what you are in fact being drawn into is Amanda Lwin’s immersive art exhibition Unreal Estates. 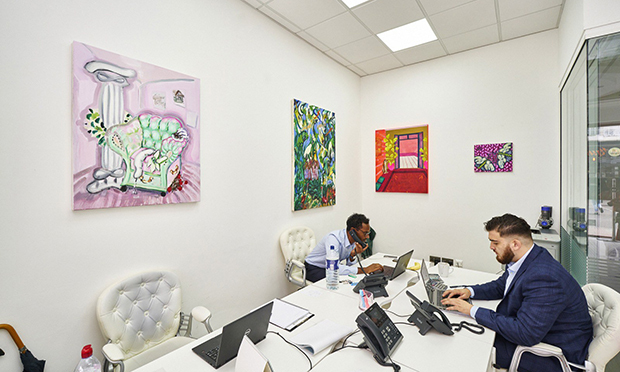 This delightfully refreshing project is made up of paintings hanging in the ground floor and basement of Homefinders, together with a series of commissioned texts describing a clutch of fantasy properties. To put the show together, Lwin hooked up writers (Martin Jackson, John Z. Komurki, Karina Lickorish Quinn and Portals of London) and artists (Hannah Bays, Dawn Beckles, Elysia Byrd, Héloïse Delègue, Brian McKenzie and Anna Jung Seo) who have previously focused on interiors, and set them free to do what they like. The curatorial genius behind this discursive art is the way it feeds on house-moving emotions. One depicted property is haunted, so the text duly includes reports from both a surveyor and a psychic medium. Another features an ‘attractive Victorian terrace with toxic waste’ – toxic, that is, to the alien Vzitnixks who move in. In addition to being displayed in situ at Homefinders, the exhibition content is also found in a glossy agency-style booklet, and on the project website is a site advertising itself as a ‘nomadic estate agency’, complete with the standard map, house specs, paintings and text for each imaginary home. The Citizen caught up with Lwin on site shortly after the show opened. Describing her own work as an artist, she said: “I make things about places”. The ambiguity of urban life is a thread that runs through the exhibition. Lwin is fascinated by the richness of the cultural and physical fabric of the city, etched with the marks of all those who have lived there. Gently mocking middle-class aspirations for property acquisition (“in the centre of the word homeowner is meow”), this collection of art and text also digs deeper into understandings of place and home in the modern urban environment. “I suppose what I’m aiming for in my practice is this sense of complexity, or multi- facetedness,” says Lwin. “You can read the exhibition as exactly what it is on the surface – a group exhibition of high quality work about domestic interiors. “Indeed, the whole experience is nothing without the clever and delightful contributions of the artists and writers. “It’s perfectly fine to leave it there. But when you turn it over and look at it a different way, it becomes something else. 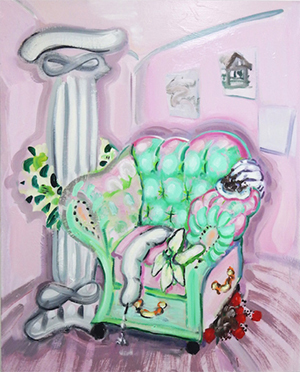 Unreal Estates is on until 13 October at Homefinders Estate Agents, 146 Kingsland High Street, E8 2NS.